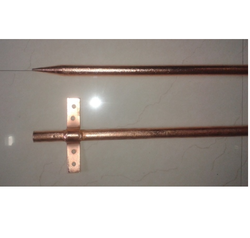 We are leading manufacturer and supplier of Earthing Rod for Solar Panel. With strong commitment to quality, we are engrossed in providing a wide spectrum of Earthing Rod for Solar Panel. The provided rod is used to connect the electric circuits of solar panel to the ground for preventing shocks. The offered rod is manufactured with the aid of forefront techniques by our diligent experts by making use of premium quality basic material. Further, this rod is made available in varied dimensions. Looking for Earthing Rod for Solar Panel ?